Throughout my work I have attempted to discover where the various Judeo-Christian traditions originally came from. Seeking these origins is, in my opinion, of vital importance for it yields invaluable information about the present sorry human condition. However, the question of origins must remain secondary to the more vital question concerning the validity of the myriad tenets of religion (specifically of Judeo-Christianity). The question of primary importance concerns whether or not the various religious tenets, customs, doctrines, dogmas and traditions have any rational value. Do they contribute to humanity's healthy development or do they restrain and inhibit such progress? Do they contribute to the spiritual wealth of nations and peoples, or are they a corrupting influence? Do they explain the mysteries of microcosm and macrocosm, or do they prevent understanding? After all, concern is warranted when we hear illustrious churchmen and theologians, in the vein of Tertullian and Augustine, loudly proclaiming that belief in God is legitimate "because it is absurd." Do Christian tenets breed love of virtue and truth, as great philosophy should, or do they subvert the natural intelligence of human beings, thereby leading to greater mental infantilism and moral meltdown? Do they provide insight for a philosophically-minded seeker, for naturally moral men, or do they satiate the sullied palates of fools, huxters and sadists? Are we knee-deep in the latter sort of creature today because of irrational belief in a psychotic god, a hypocritical religion, and a sadistic, necrophiliac priesthood? Certainly we understand Judeo-Christianity to be antique, and we now have a fair idea as to where and how it originated. What must be addressed is its overall significance. That which served mankind yesterday may be of little use today. That which inhibited man's natural evolution is of no value. That which poisoned and drugged humanity in the past must not be allowed to so infect incoming souls who must be allowed to inherit a sane and safe world in which they can know truth directly, and in which they can know themselves, as the great oracles of old directed. In the course of my expose I intend to clearly show how the Universal Intelligence (Voice of God) works with, or communicates through, the consciousness of human beings. Indeed, it is my contention that the force known as God, works through or is the human reason. The reason is the Creator's true revelation to man. Therefore it follows that the nature of any man's character - as well as his moral sensibility or virtue - depends on the manner in which he utilizes reason. It is for man to perfect, by use, the faculty that makes living an enriching and meaningful experience. To understand and apply religious tenets and principles presupposes good moral intention and a mind already sanctified. Only a rational mind can understand the supposed communications of God, should God exist. Reason is, therefore necessary to true revelation. Since reason is greater than revelation, we see how damaging and sinister it is when we are told by clerics to never question the scriptures or ask whether the "infallible" words of God make rational sense. The priests and pastors are quite content to have us do what Saint Augustine did and believe the scriptures "because they are absurd." Millions of people show themselves more than capable of such self-deception. If human reason is the "God" within, then it logically follows that anything that confounds or subverts reason must be the cause of corruption and confusion. It follows that the irrational and unsound must be exposed, routed out and cast aside. To have things remain as they are ensures that progress will be stymied. This is real Holy Work. It is by way of deconstructive and apophatic reasoning that we come upon the Truth in all areas and matters. The splendid gardens of the human reason and imagination must be kept clean of the weeds of superstition and error. A lie concerning the world, or the divine, is a lie that must be exposed by reason - a reason that is sharp and decisive. The word sanity comes from the same root as the word sanitize and so, like bodily health, the mind must also be hygienic in order to operate excellently. Unfortunately most minds are anything but hygienic. Our environment is saturated with corrupting and contaminating agents that intoxicate both the mind and the emotions. Man's spurious religious beliefs are in our opinion the chief source of psychic intoxication, absurdity and spiritual delirium. Reason exalts man, and the right operation of reason leads us toward the truth of ourselves. It allows us to glean a meaning for existence and for our role in the world. The correct use of reason is deconstructive in nature. Reason deciphers, discriminates, judges and identifies falsity. Mentally and spiritually, reason is - despite its limitations - the supreme agent of hygiene. With this in mind we see that anything which confounds reason must be considered evil. In our opinion the Judeo-Christian creed, as presented and codified by the churches, is such an evil. To prove our contentious and iconoclastic statement, we present the reader with the very material in the Old and New Testaments that we consider irrational and, therefore, morally and spiritually subversive. 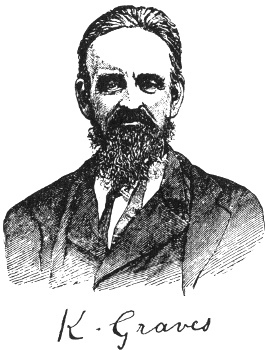 In this section it is our privilege to present the work of the great American scholar Kersey Graves (1813-1883). This master revisionist and critic of religion had his work suppressed and condemned, and his great books are difficult to find today. Along with Alvin Boyd Kuhn, Kersey Graves was one of the great American free-thinkers dedicated to help remove the ancient chains of superstition from humanity. That these exceptional men's names are not known to the average American, and to the people of the world is in our opinion a travesty that we are committed to set aright. The quotes and the excerpts presented here are abstracted from the book composed in 1923 entitled The Bible of Bibles. The interested reader is also referred to his previously penned masterpiece entitled The World's Sixteen Crucified Saviors. Both works are available from Amazon. The many errors, absurdities and contradictions presented here have not gone unnoticed by the Protestant and Catholic clergymen. They have had their apologists and experts make their futile attempts to account for the unaccountable and to explain the inexplicable. However, as humanity progresses, and as their various subterfuges become exposed, the harder their labor becomes. It becomes more and more difficult for them to convince rational men why they should merely accept the Bible as the inspired word of God. Of the many strategies employed by the clergy to explain the gross errata, there is one of especial perfidy and importance. It is reliance on the testimony of spurious "historians" who most likely never existed. This is not as incredible a strategy as we may first believe. It has served to cover many inconsistencies that compromise the professed accuracy and legitimacy of the Jewish and Christian scriptures. Since the scriptures themselves are of spurious origin, it is but one duplicitous step more to create fictitious experts, commentators, authorities and clerics to ostensibly "explain" corrupt texts that must either be accounted for or cast aside forever. Our amazement is lessened when we understand just how easy it is to fake, forge and falsely authenticate. It is not in the art world alone that we find the artifice of the forger and plagiarizer. The greatest examples of this kind of fraudulence are to be found in ecclesiastical circles. The only difference is that the experts in the art world are truly ignorant of their errors in judgment, whereas the experts in the latter case are the culprits in need of exposure. The forger who destroys the original from which he has worked is less likely to be found out. His crime can possibly, in practice as well as in theory, live forever. When we open a Biblical encyclopedia and see the names and sketches of the many illustrious historians, commentators, clerics, theologians and Church Fathers, it is not our first thought to doubt their existence. We do not automatically suspect that these figures of the past are concoctions. Those with names such as Herodotus, Paul, Eusebius, Josephus, Origen, Tertullian, and so on, have not had their existence proven beyond doubt and, once we are on to the game, we soon can judge from what ancient Roman "think tank" their names and identities were born. Outside the brave work of Conor MacDari, John Remsberg, Kersey Graves and James Wheless, few writers have taken on the task of delving into the professed existence of the many "historians" and "theologians" put before us since the early centuries AD; those to whom millions have turned for explanations of Biblical conundrums. ...no church in any age of the world has inaugurated any great system of reform for the improvement of society, but has made war on nearly every reform set on foot by that class of people which it has chosen to stigmatize as "infidels"
More than twenty sacred books have been found in various countries, which, if not in all cases denominated Bibles, have at least been venerated and used as such, and, properly speaking, are Bibles...All of these Bibles possess some common characteristics. One can only wonder why we have not heard more debate about this passage. And if Paul (the supposed author) really meant this, we have a great deal to debate. This passage is letting us know that one does not necessarily need the Bible to be moral, a great contradiction to what has been said by the clergy who set forth the Bible as man's only means to morality and salvation. So we are to understand nature as a teacher of the ways of God, not the Bible. The very essence of God is discerned through the physical and natural world. Why was this fact not taught by those who went around, in the name of Christianity, slaughtering all the nation's indigenous people? In same vein, we find Jesus himself saying: Know ye not of yourselves what is right? "Authorized" Does Not Mean "Authentic"
Anyone who is familiar with the elements of the higher criticism knows that there are two stories of the Creation and the Fall of Man in the Book of Genesis. The first, or Priestly Account, was written in the fifth century BC, and extends through the beginning of Genesis through verse 3 of chapter 2. The second, or Jehovistic Account, begins with verse 4 of chapter 2, and extends through the third chapter. This version of the story was written in the eighth century BC. It is interesting to note the second narrative is about three-hundred years older than the first. In the Jehovistic Version: The world is at first a dry plain. There was no vegetation, because "the Lord God had not caused it to rain upon the earth." In the Priestly Version: Birds and beasts are created before man. In the Jehovistic Version: All fowls of the air are made of the ground. In the Priestly Version: Man is created in the image of God. In the Jehovistic Version: Man is made out of the dust of the ground. It is only after eating of the forbidden fruit that god said: "Behold, the man is become as one of us." 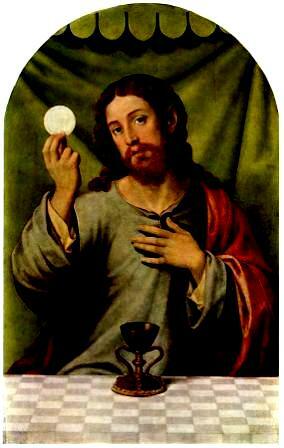 In the Priestly Version: Man is made Lord of the whole earth. In the Jehovistic Version: Man is merely placed in the garden to dress it and keep it. In the Priestly Version: Man and woman are created together, as the closing and completing work of the whole creation. In the Jehovistic Version: Man is created first, then beasts and birds are, which are named by man. Finally, woman is made out of a the man. If God "created the heavens" (Gen 1) and heaven is his "dwelling place" (see 1 Kings 8:30), then where did he dwell before the heavens were made? God creates light and separates light from darkness, and day from night, on the first day. Yet he did not make the light-producing objects (the sun and the stars) until the fourth day. As we are told God created the light (Gen 1:3), the conclusion is forced upon us, that, prior to that period, he had spent eternity in darkness..."God saw the light that it was good" (Gen 1:4). Hence we must infer that God had just got his eyes open, and that he had never before discovered that light is good. Of course it was good to be delivered from eternal darkness. "And God divided the light from the darkness" (Gen 1:4). Hence, previous to that period, they must have been mixed together. Philosophy teaches that light and darkness never can be separated any more than heat and cold, as one is only a different degree of the other. The Bible teaches that the earth came into existence three days before the sun, but science teaches us that the earth is a child or offshoot of the sun. "And the earth was without form, and void" says Genesis 1:2. But we wonder how it can be an earth at all then given the usual and rational meaning of the word void. How can an empty nothing be a something with a name? The Bible is off to a great start. In the Bible we are told by the author that Jehovah created "mornings" and "evenings" before he created the sun. Is this another miracle, or just the product of the reasoning and scientific knowledge of the authors of this garbled travesty, composing centuries later, during the Dark Ages, after Christianity had already come into existence to plague the world? The Bible tells us that "God made two great lights, the greater light to rule the day, and the lesser light to rule the night; and god set them in the firmament to give light to the earth (Gen 1:16-17). That is, he made two round balls, and then stuck them into holes scooped out of the firmament for the purpose. This seems to be the idea. Here is disclosed the most egregious ignorance of astronomy. Think of that stupendous solar luminary, as much larger than this pygmy planet as a man is larger than a mouse, being hung up or stuck up above us for our sole accommodation. How sublimely ridiculous! The Bible represents the great world-builder, the almighty architect, as spending five days in plodding and toiling at his little mole-hill of ours before he got it finished...and then made such a bad job of it that he repented for having undertaken it...But when he came to make the countless worlds, the vast suns, and systems of suns...these were all made in a few hours. "And he made the stars also." According to the Bible, God became so tired in the business of world-making that he had to take a rest of a whole day...but geology and philosophy both teach that creation never was begun, and never will be finished, but is going on all the time. Due to the controversy over the idea of a six-day creation, Biblical authorities came forth with a seemingly clever explanation. Without precedence they declared that a Biblical "day" was really a period of a thousand years. This seemed the right amount of time to cover the glitch in understanding. A hundred years might sound too short a time, and a million years was certainly too long in their minds. So, with no more ado, a Biblical "day" became a thousand years. Naturally, by the same logic a Biblical week could then be any amount of millennia, and a Biblical year could be any amount of aeons. All this bunk, when it would have been so simple to just have been given the actual length of time in the first place. But of course, we know that this was the problem. The amount of time to create the creation had to be left vague, since there was no such creation as is stipulated in the Bible. The creation, as mentioned in the Bible, is a creation of imagination for the imagination. There is not a shred of fact in it. ...we are told that a day in the Bible means a thousand years. Then, as the Sabbath day constitutes one of the days spoken of in the Bible, and was provided as a day of rest, Christians and the Bible believers should rest a thousand years at a time; and as God rested a whole day (a thousand years), he must have been as tired of resting as he was of world-making. The Bible teaches that whales, fish, and birds were made on the same day; but geology assures us that fish came into being long before fowl...The Bible teaches that beasts and creeping things were all made on the fifth day of creation; but geology tells us that reptiles and creeping things crawled upon the earth millions of years before beasts came into existence. According to the Bible, a serious blunder was made by Jehovah in the work of creation, by exhausting all the materials in the process of world-making and man-making, so that nothing was left to make a "helpmeet" for Adam; and this blunder caused the necessity of robbing Adam of one of his ribs...But common sense teaches us that a small crooked bone but a few ounces in weight could not furnish half the material needed to constitute a woman. The Parsees , with a little more show of sense, tell us that the rib was used merely as a back-bone, around which the woman was constructed. In the first chapter of Genesis we are told that Adam and Eve are created together, at the same time, whereas in the second Chapter Eve is created after Adam. (Perhaps this was an editing error). As the Bible teaches that Adam named all the beasts, animals, and birds, it must have occupied a great number of years for the Lord God of Moses to have caught and taken the several hundred thousand species to Adam to receive names in all the three-thousand languages, and then convey them back to their respective climates. The question naturally arises, Why should Adam give them names...when there was nobody present to hear it and be benefited by it? And nobody could have remembered half the names had they been present. No, no one could have remembered the billions of animal names, and we can assume that Adam could not have remembered all the names he came up with for all the world's animals. Perhaps he wrote them down with pen and ink provided by the Lord. Perhaps, he was literate enough to read and write as well as name animals. One thing is for certain, Adam must have had a lot of free time to make this task his priority. There are two Creation stories in the first book of the Bible. One can be found in Genesis Chapter 1, and the other in Chapter 2. In the first Chapter we read that the animals are created before Adam, and in the second Chapter, they are created afterwards. This is a major contradiction in the very same book, just lines away from each other. If this is the level of accuracy in the Bible, we are in trouble from the start. But then we encounter yet another contradiction. In chapter one we read that the earth is created several days before the firmament (heaven), whereas in the second Chapter of Genesis we read that earth and heaven are created on the same day. Again, the account is contradictory. Genesis 1 says that Adam was created in gods image, but in Chapter 2 he was made to "till the ground" for there was no one to carry out this function. Pity god did not create an already tilled ground when he fashioned the earth. In the first story, Graves notes that man appears to be godlike, and therefore has dominion over the whole earth, whilst in the second chapter he is now a humble servant made to labor in the gardens of the Lord. There were two trees in the garden. They are central characters in the primal drama and yet we are told so little about them. One has been referred to as the "Tree of Life" and the other as the "Tree of the knowledge of Good and Evil." These attributions are not explained and we are left to imagine what these trees really are and why they were put, as distractions, before the innocent pair whom god had filled with desire to sin. However, when we do our homework we discover that the Tree was a seminal creation image employed first by the Gaelic Magi in Ireland. From Ireland the symbol of the World Tree was transported to the Teutons and the Norsemen, and from there to other locales. The Tree was a symbol of organic creativity, of the movement and mystery of nature. It was a symbol which stylized the descent of creative energy from the supernal realms to the physical. The World Tree was the reverse of the physical tree. Instead of its life-force coming from the ground upward, the World Tree's vital force descended from on high downward. There were 22 branches on the Tree of Life, though the life-force traveled usually through 9 or 10 main centres or spheres. It was such a known and important leitmotif within the Gnostic and Hermetic Traditions of old, that it turned up in the Book of Genesis which, for all its contortions and unnecessary embellishments, is a replica of the Egyptian (and Irish) Creation Myths. That little is said of the Tree, except that it is an object of desire and forbidden intent, tells us that little was known of it by the Bible authors who appear to not be personally privy to the depth of the original canon that they were plagiarizing. Wherever else the Tree story appears in the world, it is always in the keeping of envious gods who are afraid that its secrets may be known to the angels and human creatures. In all these legends the serpent is the guardian of the tree, set there by god to protect it from the curious. In some stories the guardian is a monkey; the monkey being a form of the Egyptian god Thoth. In most cases the forbidden secrets of the Tree are available only to those who have the inherent ability to accept the secret. In the authentic telling of the legend, those without the inherent capacity for an understanding of the secret are neither attracted to the secret nor altered in any way from its proximity. In the tangled re-telling of Genesis, it is clear that the primal parents were being punished not for acting on sinful desires put in them by the Lord himself, but for their free-will, their free choice of action against the Lord's meaningless prohibition. They are penalized and ruined due to the operation of natural drives. They are disobedient to god but obedient to their own senses, their own heart's desire and their own natural inclinations. Though the serpent has come down to be a symbol of temptation, a proper reading of the drama shows the serpent to be more a symbol of independence and freedom. A slave is slave even if god is his master. And slavery is not spiritual, not in any time or in any place. Disobedience can only occur if one has to rebel against something that restrains. And such rebellion is a good and necessary thing. God does not reward man for his natural disobedience, but the serpent does. Man is bestowed total comprehension when he eats of the tree. He does have his eyes opened, and does not die, as Jehovah said he would. The serpent's word is more true than god's word. Adam becomes a god in his own right, and this is surely what compromises the god of the Old Testament. It is that Adam becomes his own authority that rankles the orthodox status quo. And this self-dependence is as taboo now as it was then. Sadly, most men have subconsciously accepted the Orwellian programming of "Obey and be Free!" Some few, however, know this Double-Speak to be the monstrous psychic tyranny it always has been. Adam was told that he would suffer death if he ate of the forbidden fruit. But as Graves relates, how would Adam have known or have feared the nature of the threat since he had never seen anything dead. And we can also question why Adam would have feared death if, as we are told, he was meant to be made in the image of god. Did our progenitor fear as we fear? Was his mind, even at that early time, filled with anxiety and foreboding? Did God create beings in his own image and then treat them as if he wished to tantalize them and render them unhappy? It would seem that he created man for no other purpose than to tease and torment him, and quarrel with him. Common sense would suggest it to be the act of an ignoramus or a tyrant to implant in man the desire to eat fruit which he did not allow him to eat...God must have had the power without the will to prevent the act of disobedience, which would make him an unjust and unmerciful tyrant. Or else the will without the power, which would make him a weak and frail being, and not a God. The "God" spoken of in the Book of Genesis, and throughout the Christian scriptures, is psychologically speaking a projection of the human ego, which came into being 13,500 years ago in order to offset the complete psychic breakdown suffered by survivors of the great earth cataclysms and upheavals now known to have wrought havoc throughout the globe at that time. This "god" is an extension of the human drive or will to exist and is phylogenetically very young. It acts like a child and is patently animistic and violent. Like William Blake's devilish Orc, the ego was born in flames. Man could not have survived without the advent of the ego which, like a muscle, saved human consciousness from complete traumatic overload. However, since the ego was born from trauma of unimaginable magnitude, its drives are "spastic" and overly sensitized to threat. Should a threat appear from outside, the ego reacts with flight or fight tendencies. It does this on the personal level and collective level. The scriptures make a great deal more sense when it is understood how God is made in man's image. Man (Adam) has indeed been tormented by the God that saved him from annihilation. This "God" energy functions best under pressure of trauma, and this is why our world and our thinking is so malignant. Silence, calm, peace and respite are not conducive criteria for the existence of the ego or pseudo-self - the projector of the vengeful, brooding God who hides in plain sight. There is nothing very unique about Yahweh, as Massey, Kuhn, Graves and others have shown. He was not the only god of the Israelites and his name can be found in earlier times among differing peoples, later falsely purported to be the Israelites of the Old Testament. Moreover, every epithet given to Jehovah ("lord of heaven," "the most high," etc,) were used time and time again for Marduk, Baal, and other gods and deities of the ancient world. If Jehovah was so unique, why did his followers not come up with brand-new epithets? Why borrow from nations thought pagan and infidel? No, facts are facts; there is nothing unique or holy about the Jehovah of the Bible. Man's god is nothing but a projection of his own ego-consciousness. Many are the proofs for this psychologically legitimate assertion. But one of the best proofs concerns the "all too human" traits of Jehovah. God creates man and then laments that he has created such a wayward and evil thing. He first declares his world "good" but then, strangely, finds it so full of flaws, so full of evil, that he decides to eradicate the whole of his creation. He is full of remorse for creating man, but after he wipes out all creation, he is remorseful about that also, and promises never to do such a thing again (Gen 9). So Jehovah's response to evil in the world, is to commit an act of global genocide. We can only wonder at these accounts, and surmise that what god really objected to was not Adam and Eve's natures, but their lack of obedience. Was it the free-will exercised by the primal parents that so infuriated the Lord? Obedience is after all considered the foremost virtue in the Bible. And the opposite of obedience to authority is free will. Is this the reason for the wrath in the Book of Genesis? It certainly seems to be so. The story of an Ark, a Flood and of the world's destruction did not originate with the Bible's version. In fact, the story of Noah is quite a late rendition. Thousands of years before, the Irish Nuah or Nuada, brought his people to safety on Ireland's shores in long boats constructed to weather the destruction of Atlantis and the lost continents of old. All of the great nations had stories of a great flood and of the few survivors. The Persians and Chaldeans had their survivor Xisuthra, who was warned by god in a dream, and who was told to save his wife and daughter and every pair of animals in the world from the coming destruction by rain. The Greeks had their Deucalion whose story is almost identical. The Chinese have their Fohi, the Brahmins their Manu, and the Hindus their Satravarata. One legend the world over. God then goes to a drunkard ("man just and perfect") called Noah, and tells him to ensure his own family's survival by building a peculiar vessel that would ride out the cataclysms that the Lord was about to visit on the whole earth. Into this vessel two of every animal on the earth was to be loaded with enough food for its survival. This strange craft is 550 feet and has one small window of 18 square inches. Every animal that "creepeth" on the earth are gathered, and they embark in the ark in one day. We are told that Noah became so drunk as to strip off all his clothing, and two of his sons, to avoid seeing him in that situation, walked backward, and covered him: for which at his father cursed him. Thus it was that Noah, although "a righteous man" was not a very modest or decent one. The idea of God creating a serpent to thwart and defeat his plans and designs, or permitting him to do it, is absolutely ridiculous. How could Cain find a wife in the land of Nod (Gen 5:17) when he himself had killed the whole human race excepting his father and mother? There were then no women to make wives of. Why did Cain build a city (Gen 4:17), when there was nobody to inhabit it? As there were "workers of iron and brass" in this city, does it not furnish evidence that there was a race of people who had attained a high state of civilization before Adam was made...If Cain did find a wife in the land of Nod, is it not evidence that some of his ribs had been converted into women before Adam's time?...Did not Jehovah know, when he accepted Abel's offering and rejected Cain's, that he was sowing the seeds of discord that would lead to murder? And we note also that Cain did not require any "serpent" to spur him to his murderous deed. So, was his action prompted by his own nature given him by god? Nowhere does it say otherwise. In this case, we have human beings whose malefic actions are not prompted by any external agency. How is this to be explained away? The Pharaoh becomes hostile to half Israelites like Moses' mother. He orders that all Israelite children should be killed at birth. We are not told the reason for this decision. The mid-wives disobey the Pharaoh, saying that the Israelite women give birth so fast and lively that they get their too late to do any killing (see Exodus1:22). Moses therefore survives, and his hidden by his mother. After a period of three months she strangely changes her mind about hiding him, and places him in a basket and sets him onto the river Nile, within shot of the Pharaohs palace. She comes so close to the palace that an unnamed Pharaoh's daughter espies the basket as it is travels through the reeds. We are not told why a loving mother who has been hiding her child from death, should suddenly decide to put her child onto the river for the crocodiles to eat. After the Pharaoh's daughter has her servants retrieve the basket, she falls in love with the foreign child and decides to take for herself. The fact that it was totally against the law for any unmarried Pharaoh's daughter to adopt a foreign child does not seem to worry this author, who penned this preposterous story centuries after the time it was said to have occurred. Nevertheless, the next amazing thing that happens concerns the immediate appearance of Miriam, the sister of Moses, who happened to be in the area watching what was happening. Now, seemingly with no care for her own security, she appears to the Pharaoh's daughter to ask her whether she needs a maid to look after the child she has just that moment found among the bulrushes. The Pharaoh's daughter decides that it would be a good idea to get a maid to look after the child, and Miriam suggests that she has the perfect care-giver - the original mother of Moses. She deceives the Pharaoh's daughter who, unwittingly, entrusts her son adopted infant back into the care of the real mother. We are not told why, at this point, the Israelite child is still not in mortal danger that was, after all, the reason for casting him out onto the river. We are never told why the son of Asiatic shepherds would be a threat to the King of Egypt, why his daughter would go against sacred law, or why she would not have care-givers of her own for her child. We are not told why Moses' mother was so close to the Pharaoh's palace, or why Miriam the strange sister should suddenly just appear at the right moment and be able to approach the bathing Pharaoh's daughter, who seems to be hanging around the banks of the Nile to wash herself, in public, as it seems. It is reasonable to assume that scribes who wrote their accounts of these happenings many centuries later did not invent the facts but based what they wrote on genuine historical events whose memory had been transmitted orally for generations, with the distortions and accretions that are inevitable when stories are passed on by word of mouth. Chapter 47 of the Book of Genesis, we read that Joseph was given the right by Pharaoh to bring his father and brothers into Egypt, to live in the area known as Goshen. It is from this event that the Israelites begin their stay in Egypt. God declares that his people will spend 400 years in Egypt as slaves (Gen. 15:13). However, in the same book, we have another figure given for the years of slavery. In Exodus 12:14, we read that the period of enslavement was 430 years. The Israelites come to an impassable sea. God causes a great wind to descend that is so strong it parts the waters pushing them back for a time, allowing the Israelites to cross. Of course we are not told how the Israelites could cross the Red Sea in such a wind, one so powerful as to push back millions of gallons of water. One would think that this wind would be more of a deterrent than the waters themselves. We are told, in the early books of the Bible, that Jehovah was contained in the Ark of the Covenant and carried around by the Israelites. He was carried by David into war against the Philistines who were winning many victories against the Lord's "Chosen People." Nevertheless, the Philistines slew 30,000 Israelites, captured the Ark with the Lord Jehovah inside, and took it with them as booty. After many decades, the Philistines decided they could not use the Ark and gave it back to the Israelites. As it was being driven home by two cows, it nearly fell off a cliff (Exodus 20:4). A character called Uzzah, seeing that it was about to topple from the road, stretched out his hand to save the cart. He was thanked by being destroyed by the Lord. When the Ark was passing through the city of Bethshemesh, the Lord killed 50,000 people just because two curious citizens had looked upon the Ark. We must ask how it is that God can be carried round in a box, and then be captured by enemies who then, later, return God to their enemies. We can ask but we can be sure to receive few rational answers. We might also want to avoid the histories that clearly refer to, and even depict, the Hindu Ark and the Egyptian Ark that were also carried aloft by the priests and that operated miraculously. We are told that Daniel was brought before the Babylonian king Nebuchadnezzar to interpret his dreams. We are not told why Daniel could do what all the Babylonian Magi could not do for their king. Nevertheless, we also find that the king had even forgotten his dream completely. Daniel had to remind the king what his dream had been, before he set to interpreting it. This seems a very convenient set up, making the miraculous prophecy about as convincing as any stage conjurors legerdemain. Prophecy, magic, astrology and the arts of divination are considered taboo by God and his ministers. However, the Bible itself is packed with prophecy. Is not the whole Book of Revelation, one long prophecy? And in Matthew 1-2, is not the angel who visited the "virgin" Mary, not making a direct prophecy when he says that a child, a savior, will be born unto her? Did not Jesus prophesize when he told his disciples that he would "come again?" Did not John the Baptist not prophesize that one would come who was "greater" than he? Additionally, did not Jesus prophesize the falling of the temple, the betrayals of Peter and Judas, and did not the "three wise men" know about the birth of Jesus through prophecy? Are not the births of Samson, John the Baptist, and Jesus miraculous. Do Aaron and Moses not engage in magical practices when they do the "rod and snake" trick in front of Pharaoh and his priests? Yes, prophecy and magic is all through the Bible, executed by those who are meant to be the elites among Biblical dramatis personae. Yet, the church forbids believers to empower themselves by Divination. What a mockery! What hypocrisy! "The whole earth was of one language and one speech" (Gen 11:1). In the preceding chapter there is a long list of different tongues or languages, and nations; and it is declared they were "divided in their lands, every one after his tongue, families, and nations." How contradictory! Fohi of China had the sun stopped eight hundred and fifty years before Joshua, the son of Nun, ever saw the sun. Bacchus and other God-Men of Egypt had it stopped four times. While in Greece Phaeton was set after it to hurry it up, and increase its speed...The Chinese annals state that the sun stopped ten days during the reign of the Emperor Yom. Arjuna of India stopped it several days for his own accommodation. Almost the only evidence we have in any case of the actual performance of a miracle is the report of the writer who relates it....There is not a miracle related in either the Old or New Testament that has not a parallel reported in the Bibles or sacred writings of the Orientalists.